The PlantPlus Diet Solution attempts to dispel any confusion you may have about health and nutrition related to a plant based diet. 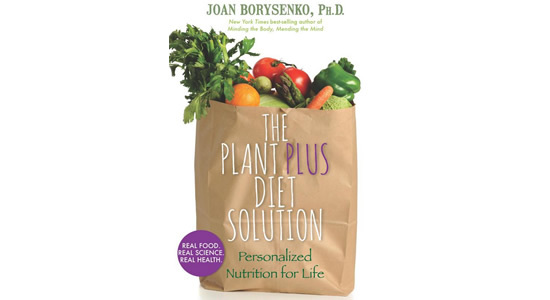 The book’s author, Joan Borysenko, Ph.D., is a Harvard-trained cell biologist, health psychologist, and New York Times best-selling author. She believes that when people have the right information they can make powerful choices to transform their lives. The book offers bite-sized servings of scientific information related to cutting edge nutritional topics. This helps you understand the relationship between your health and food to discover the best diet structure for your body. According to recent research, a plant-based diet is the healthiest way of eating. However, this program does not require you to become vegetarian or vegan. Relatively low consumption of carbohydrates. Eliminate fake foods from your life. Welcome whole foods – mostly vegetables and fruits. Avoid bad fats and substitute good fats. Find your unique Plus foods. Let what you eat delight your senses. The Plus part of the PlantPlus Diet refers to proteins, which can include fish, meat, eggs, tofu, tempeh and dairy products. These foods can be included in your diet depending on your personal preference and your unique physiology. Everyone is encouraged to begin with the reboot plan, which is a 4-week program of healthy, plant-based eating. On this diet you will avoid many carbohydrate foods such as bread, pasta, rice, potatoes, and desserts. It is a cleanse where you dump processed foods and extra carbs – including whole grains and legumes. However you don’t have to give up carbohydrates completely. PlantPlus refers to this plan as a “carb-reasonable” diet. What this means is that you can consume low-glycemic index good carbs – the kind found in high-fiber whole vegetables and fruits. Each day you will consume a pound of low-starch vegetables and up to three pieces of whole fruit. We vary considerably in the amount of carbohydrates our bodies can process without negative effects on our health. Some individuals need to continue to limit carbohydrate intake over the long term. Other people – especially active individuals and athletes – do better with more carbs in their diet. Medical tests, symptoms and your weight can provide important information to help you adjust your diet for optimal health. The PlantPlus Diet Solution: Personalized Nutrition for Life retails at $25.95. Author is trained in biology and psychology, which is reflected in a holistic approach to weight management. Includes family-friendly recipes suitable for omnivores, vegetarians and vegans. Provides information about the relationship between genetics and diet. Informs readers what tests to ask their doctor to perform to best monitor health progress. The diet is customized to suit each individual. Many people experience adjustment symptoms such as fatigue, headaches and irritability for the first week or two. Does not include a meal plan and only has a limited amount of recipes. Lacks structured guidance on how to personalize the diet. PlantPlus will appeal to dieters who wish to have a greater understanding about the science of health and weight loss. It elaborates the latest scientific research related to eating vegetables and fruits and explains it in simple language that is easy to understand. While it advocates a high intake of plant-based foods – especially vegetables – this is not a vegan diet plan. Animal products can be included in moderation depending on personal preference, individual health requirements and goals. Desjardins, Y. (2014). Fruit and vegetables and health: an overview. In Horticulture: Plants for People and Places, Volume 3 (pp. 965-1000). Springer Netherlands. Wang, X., Ouyang, Y., Liu, J., Zhu, M., Zhao, G., Bao, W., & Hu, F. B. (2014). Fruit and vegetable consumption and mortality from all causes, cardiovascular disease, and cancer: systematic review and dose-response meta-analysis of prospective cohort studies. bmj, 349, g4490.